Idaho’s recent real wage struggles and historical downturn are not unique. The trends Idaho has experienced are similar to those seen by other states in the West and the Great Lakes, and several have experienced greater declines. Idaho’s industrial makeup has changed over the past 40 years as the state has experienced an economic shift, but wages in most industries historically have been lower than the national average and continue to decline in comparison across sectors despite different growth trends. Differences in the average annual wage between Idaho and the nation are not entirely mitigated by Idaho’s lower cost-of-living. Even with a cost-of-living adjusted Idaho wages ranked last in the country in 2012. Many of Idaho’s neighbors in the West and other parts of the country experienced the same kind of wage decline as the Gem State during the past three decades, some even more severe than Idaho. Over the past three decades, Idaho’s annual average wage slipped from mid-range to some of the lowest, according to a review of the history of the average annual wage in Idaho, surrounding states and the United States. Through an analysis of aggregate wage data from Quarterly Census of Employment and Wages and adjusting wages for cost-of-living differences using the Regional Price Parity index for surrounding states in the West, Idahoans are shown to have the lowest average annual wage in the region and the country. Average annual wages are also broken down by industry within the state and compared to historical averages and trends at the national aggregate level. This shows Idaho’s wages relative to the rest of the country are lower in most industry classifications, and the differences between Idaho and the rest of the U.S. are growing. Figure above shows average annual real wages from 1975-2012 using 1990 as the base year for inflation calculations. Relative to the national average, Idaho’s wages have historically been lower. Idahoans saw their highest real average annual wage in 1977. Using 1990 seasonally adjusted dollars as the base year for all real wage calculations, the 1977 annual average wage was $22,087. It declined 17.5 percent over the next decade to $18,229 in 1990. Idaho’s wage fluctuations moved in concert with the national average in the late 1970s and early 1980s, but starting in the mid-1980s Idaho began to diverge from the national average. Figure shows Idaho’s average annual wage as a percentage of the national average. In the early 1980s Idaho wages were around 89 percent of the national average, ranking 35th of 51 in 1980. The gap between Idaho wages and the national average grew by an annual average of one percentage point through the 1980s to settle at 77.2 percent in 1990, which ranked 47th in the country. From 1990-1996 Idaho’s real average wage grew 0.7 percent a year faster than the national average, and in 1996 wages reached 81.6 percent of the U.S. average. In 2000, real wages peaked at $21,033, 78.5 percent of the national average and the highest dollar level since 1978 as Idaho experienced faster growth during the technology bubble of the late 1990s than the nation. Real wages have remained relatively flat since then during the expansion in the mid-2000s, the housing bubble build-up and subsequent financial market crash in 2008. Idaho’s real average wage did not increase as much as the nation’s before the financial crisis but did not fall as much during the recession. In 2012, Idaho’s real annual average wage of $20,573 equaled 73.3 percent of the national average, ranking 50th in the nation. Historically, Idaho’s neighboring states have seen much the same decline and growth trends, and except for Montana, all had higher wages than Idaho. Growth in average wage for surrounding states during the late 1990s and through the 2000s outpaced Idaho’s, leaving Idaho with the lowest wages in the region in 2012, surpassed by even Montana, which ranked 48th. Utah ranked 36th, Nevada 27th, Oregon 24th, Wyoming 23rd and Washington ninth. The only state with an average annual wage in 2012 lower than Idaho was Mississippi. Idaho did not experience the most dramatic decline relative to the other states however, many suffered wage declines since the early 1980s. Wyoming, for example, ranked fourth in 1981 and fell to 46th in the mid-to-late 1990s, but experienced a rebound over the past decade due to a boom in natural gas, oil production and natural resources, but remains 20 spots below its ranking peak. Nor is this a regional phenomonon. Some states in the Midwest and Great Lakes regions saw similar wage patterns – Ohio, Iowa, Indiana, Wisconsin and Michigan among them. The economic makeup of these states is different from Idaho, but the decline of auto manufacturing and steel production had similar effects on wages. Ohio fell from fifth in 1978 to 25th in 2012. Michigan dropped from first in 1979 to 18th and Indiana fell from 11th in 1979 to 37th. Figure shows the annual average wage rank of Idaho and its neighboring states relative to all other states and Washington, D.C. Figure shows the change in wage ranking for Idaho and selected states in the Midwest and Great Lakes regions. When Idaho’s wages are adjusted for cost-of-living differences using the Regional Price Parity index from the U.S. Bureau of Economic Analysis, Idaho ranked 50th. The overall index in 2012 was 93.6 percent of the national average to rank 31st among the states and the District of Columbia, translating to an average annual wage adjusted for cost of living of $21,980 in 2012. Mississippi, with the lowest price parity index score in the nation at 86.4 percent, had an average wage adjusted for inflation of $23,541. Montana, with a price parity index slightly higher than Idaho at 94.2, had an adjusted average annual wage of $22,410. Idaho’s price parity index was the lowest in the region and the state still had the lowest adjusted average wage. In 2008 the price parity index for Idaho was 94.2 percent and fell to 92.7 percent in 2010 before climbing back to 93.6 percent in 2012. None of the other states in the region experienced fluctuations of more than two percentage points over that time. States like Alaska and Washington, where the price parity index scores were higher than the national average, saw declines in average annual wages when adjusted for cost-of-living. Figure shows the difference in annual real wage and cost-of-living adjusted wage using the regional price parity. Broken down by industry, the gap between Idaho and the U.S. annual average wage was still apparent. Using the North American Industrial Classification System at the two-digit level, the gap between Idaho and the nation grew in 13 of the 19 private industry sectors between 1990 and 2012. The six that did not see the gap widen experienced no change or just minor narrowing of the gap. Figure shows the makeup and changes in total employment for the three industry groups. The industrial composition of Idaho has evolved since 1990. The 19 major industry sectors were grouped according to the rank of their average annual wages against the other industries, creating three groups – the six highest paid sectors, the seven in the middle and the six lowest paid. The lowest six were NAICS 44-45 retail trade; NAICS 53 real estate; NAICS 56 administrative, support, waste management and remediation; NAICS 71 arts, entertainment and recreation; NAICS 72 accommodation and food services; and NAICS 81 other services. This group made up 36.8 percent of all employment in Idaho in 1990, growing to 39 percent by 2012. Over two decades ending in 2012 this group experienced an aggregate average nominal wage growth of 87.3 percent while the U.S. average for these sectors was 91.5 percent. 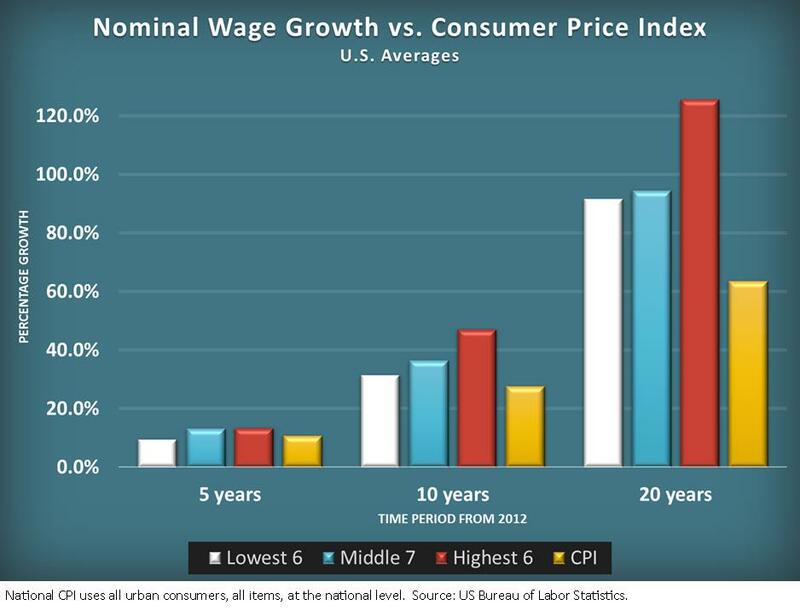 From 2002 to 2012 nominal growth was 25.3 percent while the regional inflation rate was 24.2 percent, meaning real wages increased just over 1 percent during the period. Nationally real wage growth was 4.1 percent. The five-year growth rate was 4.7 percent for this group in Idaho against inflation of 8.7 percent, resulting in a 4 percent decline in real wages while U.S. real wages fell just 1 percent. The middle seven paying sectors were NAICS 11 agriculture, forestry, fishing and hunting; NAICS 23 construction; NAICS 42 wholesale trade; NAICS 48-49 transportation and warehousing; NAICS 51 information; NAICS 61 educational services; and NAICS 62 health care and social assistance. In 1990 this group accounted for 30.7 percent of all employment in Idaho, growing to 37.4 percent by 2012. From 1992 to 2012 nominal wage growth was 79.9 percent in Idaho and 94.6 percent nationally. From 2002 to 2012 Idaho wage growth was 32.2 percent, eight points higher than the inflation rate, while wages nationally grew 12.3 percentage points faster than inflation. The five-year growth rate was 10.1 percent in Idaho – 1.4 percentage points ahead of inflation – while wages nationally were 2.5 percentage points higher than inflation. The highest six sectors were NAICS 21 mining, quarrying and oil and gas extraction; NAICS 22 utilities, NAICS 31-33 manufacturing; NAICS 52 finance and insurance; NAICS 54 professional, scientific and technical services; and NAICS 55 management of companies and enterprises. This group experienced a decline in its share of total employment from 32.5 percent in 1990 to 23.6 percent in 2012. These sectors in Idaho had nominal wage growth of 104.6 percent over 20 years, 37 percent over 10 years and 15.4 percent from 2007 to 2012, outpacing the other two groups and inflation. In addition the Idaho wages for this group of sectors grew faster than the nation over the 2007-2012 period. Nationally, wages for these sectors increased 125.5 percent over 20 years, 47.2 percent over 10 years and 13.5 percent over five years. Figure shows nominal wage growth compared to CPI growth for the three industry groups over three time periods for Idaho. Figure shows nominal wage growth compared to CPI growth for the three industry groups over three time periods for the United States. The five largest industries in Idaho in 2012 based on employment were NAICS 62 health care and social assistance at 76,810 jobs; NAICS 44-45 retail trade at 76,421 jobs; NAICS 31-33 manufacturing at 56,518 jobs; NAICS 72 accommodation and food services at 51,743 jobs; and NAICS 56 administrative and support and waste management and remediation services at 37,704 jobs. In 2012, these five industries accounted for 59.4 percent of all employment in the state. Figure shows the growth in the share of total employment in Idaho and the relative wage growth compared to U.S. averages in the health care industry. The sector with the most growth from 1990 to 2012 was health care and was the 10th highest paid sector in the state – exactly in the middle of the 19 private sectors in 2012. In 1990, it only accounted for 8.2 percent of all employment in Idaho and grew to 15.2 percent by 2012. Relative wages compared to U.S. averages fell during that time from 14.8 percent below the national average to 20 percent below. The jobs added in this sector in Idaho have been paying less than the national average and the difference has been growing. The industry with the greatest decline in overall employment in Idaho was manufacturing. In 2012, it was the fifth highest paying of the 19 sectors. In 1990, it employed 18.4 percent of Idaho’s workforce. By 2012 that was down to 11.2 percent. This sector also had the highest average annual wage among Idaho’s five largest employment sectors. Relative wages in manufacturing were also more volatile than in the other sectors with big up and down spikes in 1990 and 2000. Overall, wages in manufacturing have slipped downward, but the decline has been insignificant relative to the U.S. average wage. Idaho’s average manufacturing wage was 16.5 percent below the national average in 2012. Figure shows the growth in the share of total employment in Idaho and the relative wage growth compared to US averages in the manufacturing industry. The only industry that saw significant growth in relative wages was retail trade. Its overall share of employment in the state declined slightly from 18.4 percent in 1990 to 15.2 percent in 2012. Retail had the second-lowest average annual wage among the top five employment sectors and ranked 16th among the 19 private sectors in 2012 average annual wage. In 1990, average retail wages in Idaho were 20.2 percent below the national average, rising to 6.5 percent below the national average in 2012. Figure shows the growth in the share of total employment in Idaho and the relative wage growth compared to U.S. averages in the retail industry. Agriculture, forestry, fishing and hunting is the one industry in Idaho that has maintained wages above the national average since 1990. And while wages are higher than the national average, this sector still ranked 13th among the 19 sectors. Between 1990 and 2012, average wages in this sector have been between 0.4 percent and 8.9 percent above the national average. Even so, overall wages in this sector declined slightly from 1990 to 2012. Idaho’s average was 2.4 percent above the national average in 2012. Total employment in this industry has risen since 1990, but not as fast as the economy overall so its share of total employment in Idaho has decreased slightly. Figure shows the growth in real wages for agriculture and illustrates the decline in the difference between Idaho and U.S. averages. In 2012, 17 of the other 18 industry sectors in the state had wages 15 percent or more below the national average for the sector. Five sectors had wages lower than 30 percent of the national average, including retail trade, which was 15 percent below the national average. Preliminary 2013 wage data were released after this report was prepared, but no significant changes were noted in any major statistic. Idaho’s 2013 average annual wage per employee was $36,859, or $20,707, and the U.S. average was $27,980 in 1990 dollars. This figure is up slightly from the Idaho 2012 inflation-adjusted average of $20,573, boosting Idaho’s adjusted average to 74 percent of the average national average from 73.3 percent in 2012. The ranking for Idaho among the states was unchanged at ranked 50th of 51. Annual Wage as calculated by from QCEW only includes wage information for jobs covered by unemployment insurance taxes. While coverage requirements change over time, QCEW captures 94 percent or better of the employment universe. Wyoming had lower wages for a few years from the mid-1990s until 2000. Regional Price Parity Index (RPP1) includes prices of rents, goods, and all other purchases. Data is used from the Consumer Price Index (CPI) and Consumer Expenditure Survey (CE) from the Bureau of Labor Statistics, the American Community Survey (ACS) from the US Census Bureau, and the Personal Consumption Expenditures (PCE) from the Bureau of Economic Analysis. $50,515 per year in 2012 (nominal dollars). 1990-1993 was a volatile time for some industries with significant increases and decreases in wages due to economic developments, corporate bonuses and sectoral changes in Idaho’s economy. Idaho’s minimum wage also increased from $2.30/hr to $4.25/hr from 1989-1991 to match the federal minimum wage. Manufacturing hit a high point in 2000, where wages were slightly above the national average, only to return back to the trend of being 10-15%+ lower than the national average in 2001-2002. In 1990, NAICS 11 accounted for 5.3% of total employment in Idaho. In 2012, it accounted for 4.5 percent. This entry was posted in Employment News and tagged idaho department of labor, idaho economy, Idaho wages on January 17, 2015 by Idaho Department of Labor.